Maybank Investment has again pumped another RM8.45 million into AirAsia X to prevent its share price from falling! The Deputy Editor of Star Business, Ms BK Sidhu, has promoted AirAsia X IPO in her column that it will be over-subscribed by three to four times, HERE & HERE. Since the closing of the IPO of AirAsia X Bhd not only its IPO price has dropped from RM1.45 to RM1.25 but Maybank Investment Bhd had to come in to stabilise share price of AirAsia X Bhd two weeks in a row. 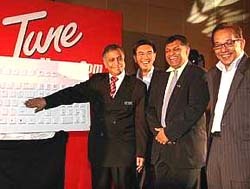 2nd left in picture: YM Tengku Aziz when he was the CEO of Tune Money, a company related to the AirAsia outfit, (he was in between the then Minister of Finance II, Tan Sri Nor Mohamad Yakop and Tan Sri Tony Fernandes, who happens to be a director of AriAsia X Bhd). This picture was taken from HERE. The CEO of Maybank Investment Bhd is YM Tengku Dato’ Zafrul Aziz in HERE. Tune Money is Asia’s first “no-frills” online financial service previously wholly owned by Tune Group Sdn. Bhd. Its founder is Dato’ Tony Fernandes, the founder of the low cost airline in Malaysia, AirAsia. Its major shareholders are Tune Ventures (44.83%), CIMB Structured Investments (25%) and TengkuZafrul Aziz (10%), who is also its Chief Executive Officer. This is taken from Wikipedia HERE. The “highly acclaimed” Ms B K Sidhu has yet to clarify what she meant by “AirAsia X IPO will be over-subscribed by 3 to 4 times”! It was clear from BK Sidhu’s said article (“AirAsia X IPO will be over-subscribed by 3-4 times”) that it was a very poor attempt by her to mislead the investing public. Of course, she was quoting her “source” without stating who was that source. It is evident that BK Sidhu’s said article was based an extremely UNRELIABLE SOURCE and it was most un-ethical for a journalist of her standing as the Deputy Editor of Business Star to behave in such a manner. The said article on the IPO on AirAsia X was not an isolated article. There are many more favourable articles that she has written about AriAsia and/or AirAsia X. The roadshow for the institutional portion, meanwhile, is still under way, The oversubscription rate for this portion is about three to four times thus far. The roadshow has yet to cover US investors. “We reckon the institutional and retail portions would be more than five to six times oversubscribed at closing,” said a source, adding that thus far, AIA and MIDF were the institutional investors keen on the shares. HERE. Business Times of NST today states that Maybank Investment has again pumped in another RM8.45 million into AirAsia X this week to defend AirAsia share price from dipping. Maybank Investment Bank Bhd (MIBB) has again pumped some RM8.45 million into AirAsia X this week to defend the latter’s share price from falling. Three filings by AirAsia X to Bursa Malaysia Securities Bhd this week showed that MIBB bought 750,000 AirAsia X shares on Monday, another 6.01 million shares on Tuesday and about 3.2 million shares yesterday at an average price of RM1.25 a share. Mercury Securities head of research Edmund Tham told Business Times that MIBB’s purchasing spree is only to create volume and help stabilise AirAsia X’s share price. “When AirAsia X’s share price is maintained, I don’t think they would need to acquire more shares. “I think their act is just a temporary measure,” he said. The share price of AirAsia X, the long-haul arm of low-cost carrier AirAsia Bhd, was unchanged yesterday at RM1.25, with some 97.07 million shares changing hands. The airline has hired MIBB to act as its market stabiliser prior to the share sale. Based on its prospectus, MIBB can buy as much as 118.5 million shares in AirAsia X within 30 days of trading. MIBB has so far injected some RM32.82 million in the airline with a total share purchase of 26.26 million shares since AirAsia X made its debut on the Main Market of Bursa Malaysia last week. On the day of the listing, MIBB pumped about RM24.4 million into AirAsia X by acquiring 19.5 million shares at an average price of RM1.25 a share. AirAsia X raised RM987.7 million from its initial public offering, of which some RM740.7 million are expected to be used as capital expenditure. This includes the acquisition of engineering and aircraft-related equipment parts as well as its planned expansion into new hubs outside the country, such as Thailand and Indonesia. Business Time Report today in HERE. KUALA LUMPUR: Maybank Investment Bank Bhd (MIBB) helped prop up AirAsia X’s shares by pumping in more than RM20 million to defend the shares from falling. The long-haul low-cost carrier, which made its Bursa Malaysia debut on Wednesday, inched one sen higher from its initial public offering price (IPO) of RM1.25. The one-sen premium saved the carrier from becoming the worst debutant IPO on the local stock exchange over the past 12 months. The bottom position still rests with Malaysia’s second special-purpose acquisition company CLIQ Energy Bhd which closed below its IPO price of 62.5 sen in April this year. Prior to the share sale, AirAsia X had hired MIBB, a unit of the country’s top bank Malayan Banking Bhd, to act as market stabiliser. As stabilising manager, MIBB can buy as much as 118.5 million shares in AirAsia X within 30 days of trading, the aviation company had disclosed in its prospectus. On Wednesday, MIBB bought 19.5 million AirAsia X shares at an average price of RM1.25 a share. Trading was tight, with the stock price moving between RM1.25 and RM1.28. Traders had warned that there were waves of sellers, thereby curbing the share price rise, which they said were due to retail investors holding a large number of shares. Pre-IPO shareholders, whose ownership cost was below RM1.25 a share, also locked in some profits, fearing the broader retail market sell-off. AirAsia X raised RM987.7 million from the IPO, of which nearly RM240 million went into the pockets of some its key shareholders, including its founder Tan Sri Tony Fernandes. Aero Ventures, controlled by the tycoon and his associates, saw its shareholding in the new public-listed company drop to 34.4 per cent from 52.2 per cent, as it sold some shares to investors at the pre-IPO level. Trading on the counter yesterday was almost the same as on debut day, as dealers suspected that MIBB was continuing its mop-up operation. AirAsia X closed two sen higher at RM1.27, giving the freshly-minted IPO stock a market capitalisation of just above RM3 billion. Business Times report 12-7-2013 HERE. Next WAU! MAS reinstated “UNPROFITABLE” Dubai route! Wasn’t it declared upfront that Maybank Investment Bank would be the price stabiliser? And hiring MIB as the price stabiliser is not contravening any Bursa Malaysia or Securities Commission regulations, is it? So, why all the angst now? And here’s a thought – those who think that AirAsia and AirAsia X shares are bum investments should put their money where their mouths are and massively short these shares. Let’s see if you have the courage of your convictions by backing them up with hard cash! you must be from Maybank Investment. Why sound so defensive if you believe AirAsia X is a good stock? Pathetic! The picture of Tengku Zafrul, Nor Yakop and Kalimullah clearly tell a story. They were all associated with Tingkat Empat. Never knew that they are still running high now. The picture is clear now. Another project by Tingkat Empat. What is SC doing about this matter. I hope that Maybank Investment and Tengku Zafrul will bake AirAsia X share until the end. May be BK Sidhu will buy up some to show that she had the confidence in AirAsia X until the end.